What is fibromyalgia syndrome? The best way to explain this condition is to discuss the symptoms it results in and the possible causes. However, we want you to come away from this article with hope. 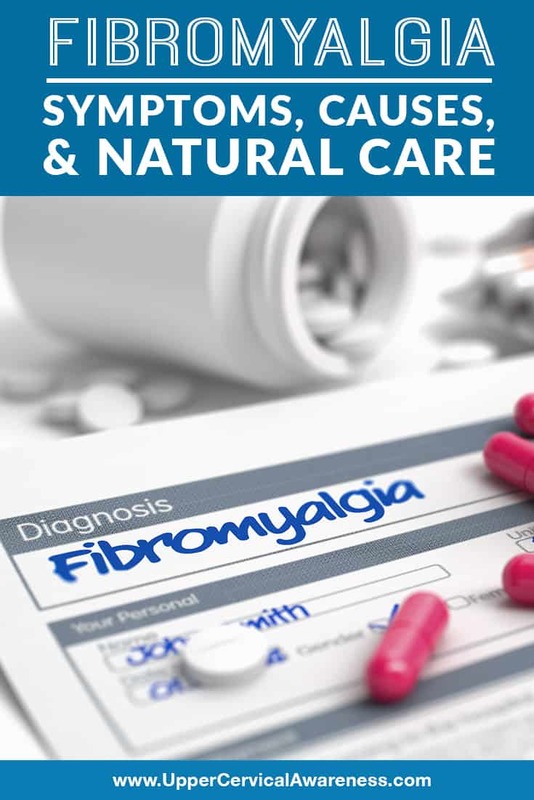 So rather than focusing too long on what fibromyalgia is, we are going to lead into some ways to use natural care to cope with this chronic health ailment. Fatigue – Fatigue and malaise may be so severe that fibromyalgia is sometimes confused for chronic fatigue syndrome. Insomnia – Pain and other symptoms can make it difficult to fall asleep or to stay asleep. Lack of sleep, in turn, makes it more difficult for the body to process pain. Tender points – There are 18 tender points on the body that are used for fibromyalgia diagnosis. These 9 pairs of points are spread across the body. However, many are close to the spine. We will address this more when discussing possible fibromyalgia causes. For now, just keep in mind that a doctor will be looking for you to hurt at 11 of these 18 tender points to make an official diagnosis. Fibro fog – Cognitive symptoms of fibromyalgia are some of the least understood and most debilitating. Inability to concentrate and memory problems are the most common cognitive symptoms. Numbness and tingling – This symptom is particularly common in the hands and feet of a patient. Temperature sensitivity – Fibromyalgia sufferers often experience sensory sensitivities that include severe sensitivity to both hot and cold temperatures. Mood changes – Anxiety, nervousness, and mood swings are common. Many fibromyalgia patients also suffer from depression. However, this is not a symptom but an associated condition. Besides symptoms, doctors will also be looking at the length of time you have been in pain and may want to rule out other health problems that could cause similar symptoms and that have more definitive tests. Let’s take a closer look at the fibromyalgia tender points to see if this can direct us toward an underlying cause and a way to find natural relief. While there is no one cause of fibromyalgia that has been identified, there are a number of risk factors that may help us to identify how this condition occurs. One very common factor is trauma. Whether it is a history of an accident or an injury, abuse or assault, or posttraumatic stress, most fibromyalgia sufferers have a history of trauma. This is accompanied by research that shows women are more likely to have fibromyalgia and that it is more common among those with anxiety or depression. Trauma makes sense as an underlying cause when you also consider where fibromyalgia tender points are located. Four are located in the neck (2 in the front and two in the back). Four more are located in the lower back and hip region. Another four are centered around the upper back and shoulders. Add in the two in the chest, and that places 14 of the 18 tender points in proximity to the spine, many near the neck. The last four are in the knees and elbows. However, these are both areas that are connected to nerves that come from the spine. In fact, the nerves for the elbows are in the neck as well. For this reason, some healthcare professionals have posited that fibromyalgia actually comes from the neck. What effect can the upper cervical spine (top two bones in the neck) have on the central nervous system (CNS)? Reduced blood flow – The cervical spine facilitates blood flow to the brain, but misalignments can affect this proper flow of blood. Inhibited brainstem function – The C1 (atlas) surrounds the brainstem right at the sensitive area where it meets the spinal cord. As a result, many of the body’s natural processes can be affected as well as the signals that are sent between the body and the brain if there is even a slight misalignment. If an upper cervical misalignment could potentially be at the root of fibromyalgia symptoms, then correcting the misalignment could present a natural way to get some relief. Upper cervical chiropractors are subspecialists in the chiropractic field who focus on the top two bones in the neck. Diagnostic imaging is used to precisely measure any upper cervical subluxation, whether it is the result of trauma or another underlying factor. Once the misalignment has been accurately measured, the practitioner can calculate a specific adjustment for you. Adjustments are extremely gentle and are nothing like the popping and twisting you may associate with chiropractic in general. This is perfect for a person who is already in pain and doesn’t need their neck jerked around roughly. For many patients, there are both immediate benefits as well as those that continue to build over time. In some case studies, fibromyalgia patients have seen symptoms melt away after just a few months of care. If you feel that this form of care is worth a try for you, we urge you to contact a local upper cervical practitioner. The search feature on this website can connect you with a member of our preferred list of doctors. Scheduling a consultation today may be what sets you on the path to better overall health and wellbeing.